Sean Kelly is delighted to participate in Frieze New York, 2015 (Booth C35), where we will present a curated group of works with a focus on abstraction by the following artists: Los Carpinteros, Jose Dávila, Iran do Espírito Santo, Antony Gormley, Candida Höfer, Callum Innes, Idris Khan, Hugo McCloud, Mariko Mori, and Frank Thiel. During the fair, Candida Höfer: From Düsseldorf will be on view at Sean Kelly Gallery, 475 Tenth Avenue at 36th Street. 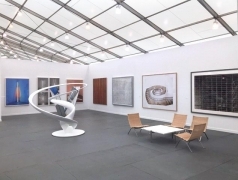 On Saturday, May 16, the gallery's hours will be extended until 8PM as part of Frieze Chelsea Night. For press inquiries, please contact Christine McMonagle at the gallery (212.239.1181) or via email at christine@skny.com. For all other inquiries, please contact Cecile Panzieri at the gallery (212.239.1181) or via email at cecile@skny.com.